Purple Loosestrife, which often grows in profusion, is one of the most striking of waterside and wetland plants. Purple Loosestrife is a perennial plant, growing to between 1 and 2m in height and often forming dense colonies of erect stems arising from a single rootstock. The square-section stems are flushed with red or purple and carry a sequence of whorls of three lanceolate downy stalkless leaves. The flowers, which grow in tall spikes, range from white through pink to deep purple; the pale and dark varieties are generally the result of cultivation, however, while rosy-purple is the natural colour of the wild form of this flower. Individual flowers are 10 to 20mm in diameter and have 12 stamens surrounded by five or more often six petals. Rather like Primroses, the length of the stamens and the style vary, helping to increase the probability of cross polination rather than self polination. This lovely wildflower is widespread throughout the UK and Ireland and is also found in most other mainland European countries, including Slovenia. 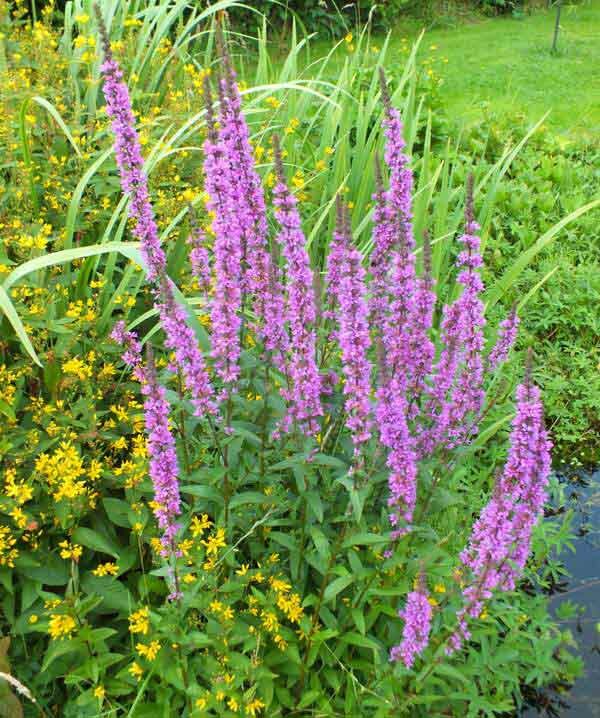 Purple Loosestrife is an invasive alien introduced species in North America, where it has colonised many waterside sites at the expense of native flora. 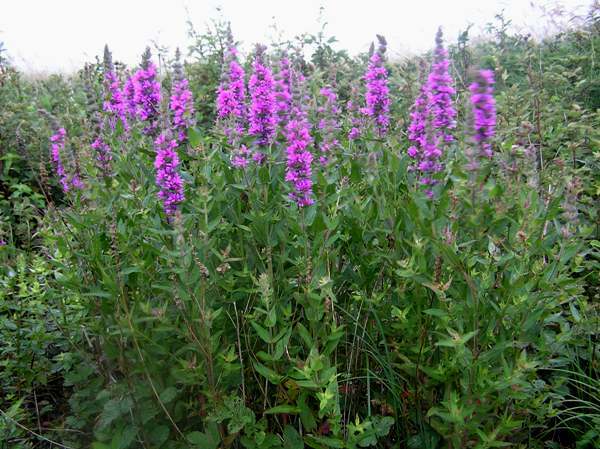 Purple Loosestrife is usually considered a chalk-stream flower, and certainly it thrives on chalky soil. It can, however, be found beside many lowland rivers in mildly acid areas. This wildflower also grows, sometimes with its roots immersed in the water, around ponds and lakes. This is a late summer wildflower and comes into bloom from June onwards, usually lasting until the end of August and occasionally well into September. 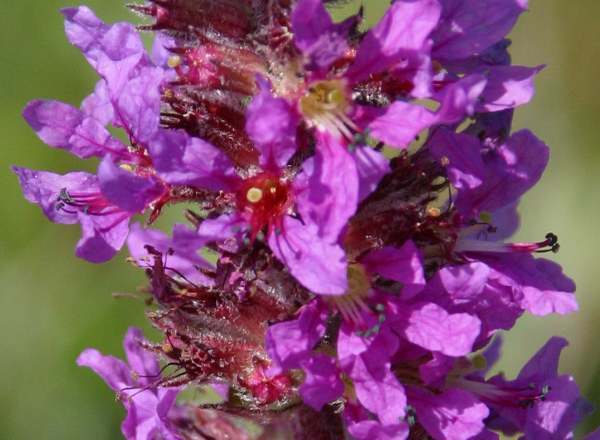 Bees, butterflies and other insects are attracted to Purple Loosestrife, which is a valuable source of nectar. In the past this plant was considered to be a useful herb for treating diarrhoea and other gastric ailments. Yellow Loosestrife Lysimachia vulgaris does not look much like its namesake Purple Loosestrife, and indeed that is hardly surprising because it belongs to a different plant family, the Primrose family. The specific epithet salicaria means willow-like; it refers to the shape of the leaves of this plant. Loosestrife, the common name, suggests that this flower releases the holder or beholder from stress and strife. The plants shown on this page were photographed in West Wales during July.